all important centres. The Cumberland Valley road connects it with the great Pennsylvania system and the Baltimore and Ohio gains access to it by its Washington County Branch. 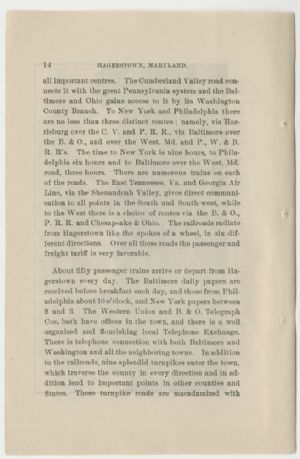 To New York and Philadelphia there are no less than three distinct routes; namely, via Harrisburg over the C. V. and P. R. R., via Baltimore over the B. & O., and over the West. Md. and P., W. & B. R. R's. The time to New York is nine hours, to Philadelphia six hours and to Baltimore over the West. Md. Road, three hours. There are numerous trains on each of the roads. The East Tennessee, Va. and Georgia Air Line, via the Shenandoah Valley, gives direct communication to all points in the South and Southwest, while to the West there is a choice of routes via the B. & O., P. R. R. and Chesapeake & Ohio. The railroads radiate from Hagerstown like the spokes of a wheel, in six different directions. Over all these roads the passenger and freight tariff is very favorable.